The internet is helping to improve the quality of life in Inuit Nunangat. It connects individuals across northern communities as well as those in the South and is increasingly helpful to the growth of local businesses and entrepreneurship. This is partially achieved through the accessiblity of free social media services such as Facebook – advantageous for its ease of use and ability to load in very low bandwidth environments. 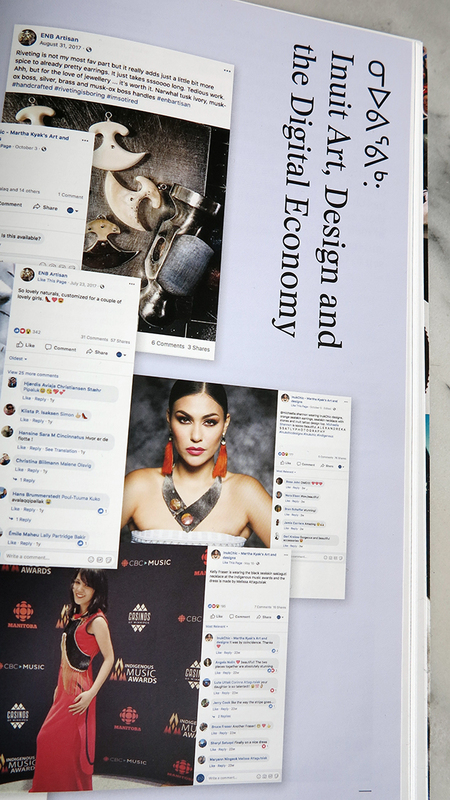 What new opportunities and challenges could this digital space, beyond pre-existing distribution systems, present for Inuit artists and designers who sell their work directly to consumers? 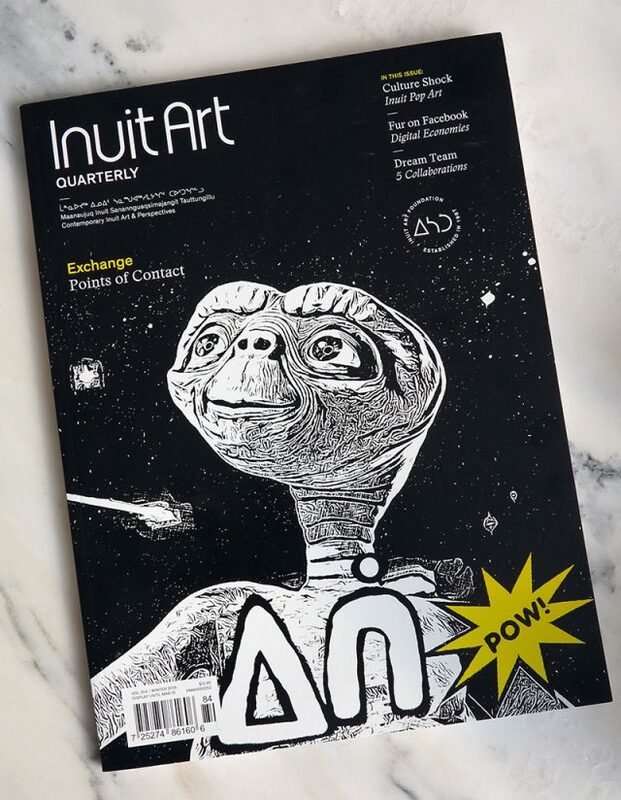 I finally picked up the Winter issue of Inuit Art Quarterly (IAQ) at Ottawa Art Gallery‘s (OAG) gift shop. IAQ’s publishing team puts out one of the most lush and beautifully designed art magazines in Canada. The mag is stunning and packed with eye candy everytime. 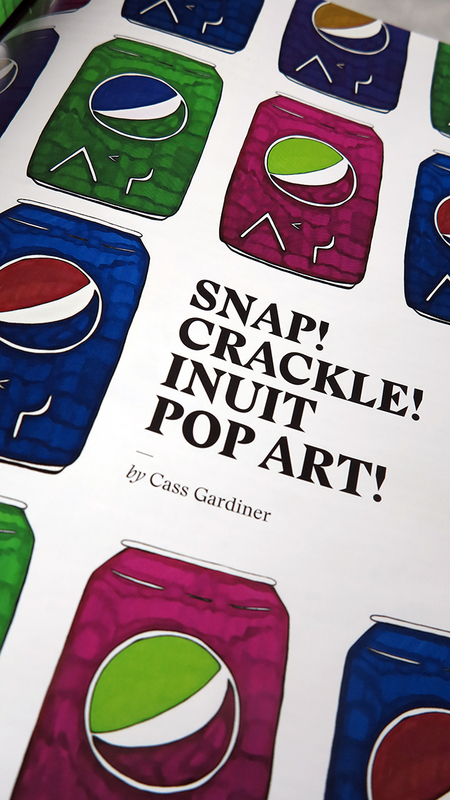 As a digital designer, the article Inuit Art, Design and the Digital Economy, was of particular interest to me. It showcased the work of InukChic, the jewellery brand by Mittimatalik (Pond Inlet) raised and currently Ottawa-based designer Martha Kyak. 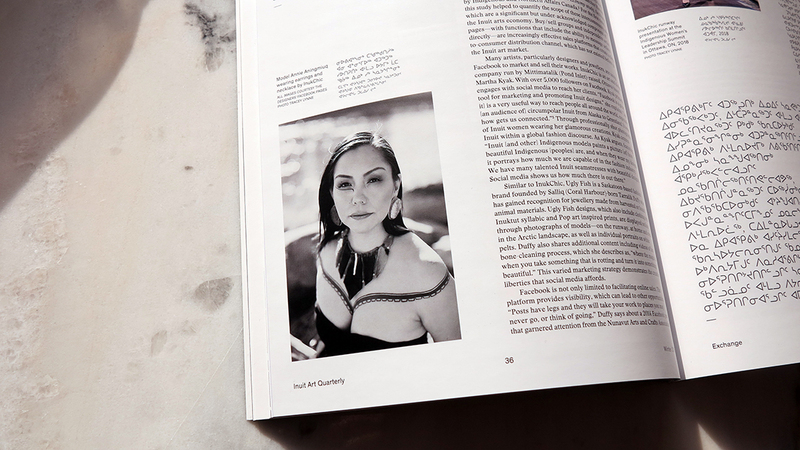 The spread features a gorgeous image of Annie Aningmiuq (Director of Indigenous Programming, Canada World Youth) who I first met at the Museum of History where she was showcasing her own designs of beaded sealskin clutches. We are fortunate that in Ottawa every two years the Northern Lights trade show comes to town along with other amazing designers and artists from the North. I never leave empty handed. In other related news, Inuk artist Shuvinai Ashoona’s solo exhibition Mapping Worlds opened at the Power Plant in Toronto this weekend along with another show, We End Up Dreaming, at Feheley Fine Arts located on George Street in Toronto. Shuvinai is best known for her highly personal and imaginative iconography, with imagery ranging from closely observed naturalistic scenes of her Arctic home, to monstrous and fantastical visions. Read more about the magazine and the Inuit Art Foundation here as well as find out how to subscribe.